Evenflo Top-of-Stair Gate The Evenflo Secure Solutions Swing Gate is an inexpensive baby gate constructed of sturdy wood and measuring 30 inches tall. This safety gate from Evenflo swings open both ways, making entering and exiting as easy as it gets for parents. It mounts securely to any hard surface and is easy to install. It's ideal for stairway use! Here is what a parent's mantra should be when seeking a safety gate: Easy for me, difficult for child. Because really, what else do you need? A good-looking gate is nice, sure, and it's important to have the right size for various entryways. But it all comes down to safety for the kid and ease-of-use for the parent. The Evenflo Top of Stair Gate meets and exceeds these stipulations. And it's not bad looking, either! This is an extremely secure mounting when used with the one-direction swing setting for the gate. A Phillips screwdriver and electric drill with 1/8-inch bit are required (not included). A mounting template is included for quick installation&#151;this is a very useful benefit, as most parents spend far more time than they had originally planned or hoped, installing gates. The gate is easy to remove (leaving the hardware in the walls) for those times when you don't need it and do want easier grownup access to the stairs. To open the gate, press in and slide out. You'll hear an audible click. Once you've got the hang of it, it's a quick, one-handed operation that will allow you to pass through the gate even while carrying a child&#151;but foil even the most dexterous toddler's attempts to break out. Keep your home safe and secure for your growing child with Evenflo's Top of the Stairs Plus gate. This protective device meets the two key demands of a safety gate: it provides reliable protection from stairs for baby and is easy for parents to set up and take down. Once installed, this sturdy wood gate has a height of 30 inches tall and expands from 28 to 42 inches wide, and helps protect children up to 24 months. Prevent any accidents by installing the Top of the Stairs Plus Gate. View larger. Designed to secure the stairs, perhaps the most dangerous of enticements for crawling babies and new-to-walking toddlers, the Top of the Stairs Gate features key safety elements to help prevent accidents. First, the four-point hardware mount ensures that the gate stays in place, even when your child is pushing against it, and is highly secure for stairs and other entryways. And the mounting works in tandem with the one-direction swing setting and the kid-proof latch to provide additional security. The Top of the Stairs Plus gate is very user-friendly. Parents can set it up in minutes with the included mounting template and operate it with just one hand--an option that's especially helpful while carrying a child. Once it's correctly installed, it can swing right, left or 180 degrees, or it can be used with the one-direction swing setting for extra security at the top of the stairs, an option that does not allow the gate to swing out over the stairs. It's also extremely convenient for high-traffic areas because it keeps baby safe while allowing adults to come and go quickly and easily. 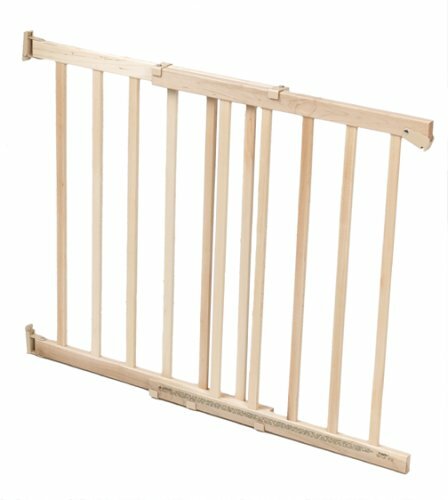 Vertical bars are crucial to any gate's effectiveness because unlike horizontal bars, they do not entice curious children to attempt to climb on them. That's why the Top of Stair Plus features vertical bars with a smooth, non-toxic, splinter-resistant finish. Built to last, this gate also features durable construction and looks attractive in any home. For added peace of mind, it comes with a limited 90-day warranty. For over 85 years, Evenflo has been a worldwide leader in the development of innovative infant equipment and is now one of the nation's leading manufacturers of high quality baby care and juvenile products. Evenflo began as a company that solely distributed baby care items. They have now expanded to manufacturing products, like car seats, strollers, high chairs, play yards and activity centers, that meet all the needs of children from birth to the pre-school years. One-hand, childproof release swing gate is convenient for high traffic areas. Removable swing control setting will not allow gate to swing out over stairs. Four-point hardware mounting--highly secure for stairs or other entryways. Installed height 30 inches tall and expands from 28 to 42 inches wide. Great product and great value! This is exactly what we were looking for. We needed a semi-permanent gate for the top of our stairs, and this product is secure and easy to install. The only issue we had was that our molding at the bottom of our walls is thicker than most, so we had to work around that. It sticks a little bit sometimes, but I think that's because we had that molding issue to deal with. The Evenflo top of stair gate is a good find. Relatively easy to install, simple design, and sturdy. We have three of these (3-story house with a second set of stairs). To install, we needed to be a little creative to account for the plaster walls (not great with screws) and baseboard (sticks out further than walls). We attached a small piece of wood (same thickness as baseboard) to the plaster wall. This evened it up and gave the screws something better to latch on to. It's not necessarily pretty, but it works quite well and the baby is safe. Very solid and safe, but takes a bit to install. Very secure... if it's closed! Perfect for everywhere in the house. Pros: Great gate, very secure and pretty cheap compared to others! I found it pretty easy to use with one hand. For those who have and old house: this one will work even if you have nothing straight or flush in you home! I'll definitively get more. Cons: The instructions are not crystal clear but it wasn't hard to guess how to install it. If there were a 6th star this gate would get it! unsafe on top of the stairs. We're using two of these in my house. The good: easy to use even in high-traffic areas, sturdy enough, easy to remove when not needed, and straight-forward installation. The only difficulty was finding wall studs to mount the brackets. Why buy 1 when you can buy 4? Very simple in design. Easy to install. Used wax to give same color as our wood floor. Dangerous - Pinches skin badly!! Update: 6-months later - the sliding mechanism has loosened up considerably with use. It now slides smoothly without pinching our hands. I've found the gate to be strong and secure - it has never weakened or popped out when my son tries to stand on it. So, if you buy it, try rubbing some wax, or something, on it to help in the beginning, because it was pretty dangerous at first. And also be aware that little hands can still get pinched in between the actual rungs when you're opening it. That will happen with any slotted, sliding gate. Some further negatives I found is that the latch is loud, and it's also difficult for grandma to open and close because she has arthritis in her hands. And with it being difficult for her to do, she tries repeatedly and the noise is very loud and annoying. I'm always afraid she's going to wake the kids. So, if you have your mom at your house a lot, get something easier. It will save a lot of frustration - for both of you! Work so well, I threw the box away and bought another.